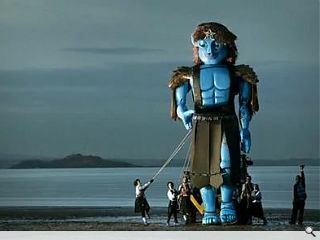 Puppet Animation and the Puppet Lab are pulling the strings of the UK's largest puppet – a 25ft blue figure dubbed the Big Man. 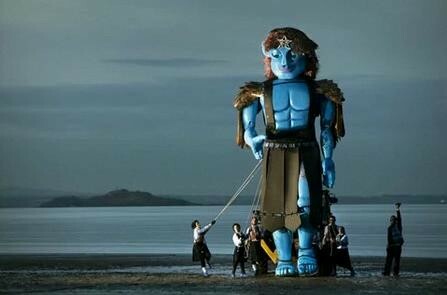 The distracting display is product of a £600k Arts Council project which will see the one and half tonne creation stride through communities from the Isle of Bute to Kirkcaldy, its blue hue selected to give the impression that a slumbering giant has fallen from the sky. The tall stranger will be guided round the highlights of his itinerary to serve as a showcase for the finest features each area has to offer, a pair of roving remote controlled camera eyes streaming all that the giant sees direct to the web. This journey commences on September 26 when the UK’s largest puppet descends on Bute accompanied by a series of local events.